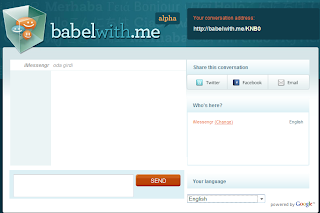 BabelWith.me is a free group chat tool that lets you communicate in one language or multiple languages (up to 45). BabelWith.me automatically translates each message as you type in real-time using Google Translation. BabelWith.me is a web-based tool, so you won't need to install any software to use it. Just start a conversation, you'll get a special URL address for your chat that you can share with friends using our Twitter, Facebook, and email integration.